Whether you just need periodic coaching to complement our online tools, or something more, our culture experts are well prepared to help you tackle any culture management challenge. Below is a pricing overview of our services. More information about our culture management segments can be found here. Coaching from one of our consultants is an easy and affordable way to get professional help customized to your needs in a way that is convenient for you. This includes up to 5 hours of phone coaching, as needed, with an experienced consultant. This level of support goes beyond technical use of the tools on the People Ink Pro site. How do I lead my team through this process? Who in my company should be involved? What are the implementation time frames? How do I prepare my team/organization for culture change? How do I create sustainability? After purchase a member of the People Ink team will contact you with follow up details and to schedule your first coaching session. Facilitation of a day and a half interactive workshop at your location. Consultation prior to the workshop on selecting participants, sending invitations, and logistics. During the workshop we facilitate a discussion about shared values and their impact on the organization. We lead teams through the process of developing core values and related behaviors. Following the workshop, we help you plan how you will introduce your values to the organization. A final Values Blueprint. Following the workshop we work with you to finalize a customized blueprint with a set of 5-6 core values created and embraced by the leadership team. Each core Value is accompanied by clearly defined behavior statements in a language and format that can be easily communicated to employees at all levels and geographical locations in the organization. A draft communication plan: We facilitate team meetings to develop a communication strategy for introducing the Values Blueprint® to your organization. Bonus: Upon completion of the workshop you are given access to our online product Values Blueprint Pro with content to help you move forward in creating the culture you want. Call or email us to discuss specifics or add the initial deposit to cart. We will contact you to schedule a workshop. People Ink provides full service expert guidance for designing, implementing, and sustaining your unique culture. Call us for a quote and to discuss your needs. Our usual on-site rate is $3,000/day for one consultant. Guidance on the selection and management of a values committee and internal culture implementation teams. Development of the plan for your values blueprint implementation. 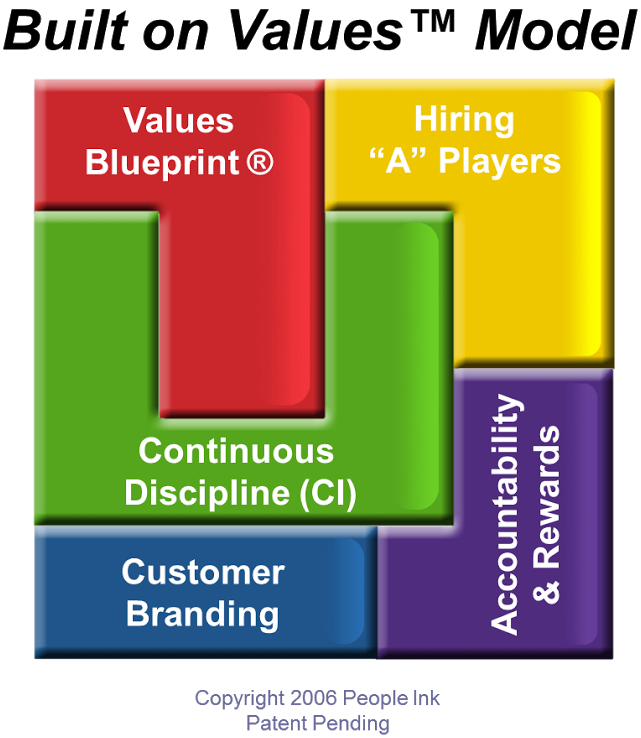 Integration of values blueprint into rewards and recognition systems. Establish accountability by integrating values into performance management processes. Developing a continuous discipline plan to sustain the integration of values and behaviors throughout your company operations. More information about our culture management segments can be found here.